Collaborations multiply the value of existing community resources, tackle unresolved needs, leverage donor gifts, reduce duplication and quicken success. Moving ahead NOW believing that the Holy Spirit will provide the resources and people to bring ideas to life that resolve unfulfilled needs and help others move toward their full potential. CHAMPIONING LIFELONG LEARNING Encouraging the self-motivated pursuit of knowledge that enhances social inclusion, active citizenship, personal development, self-sustainability and empowers seniors to feel younger. 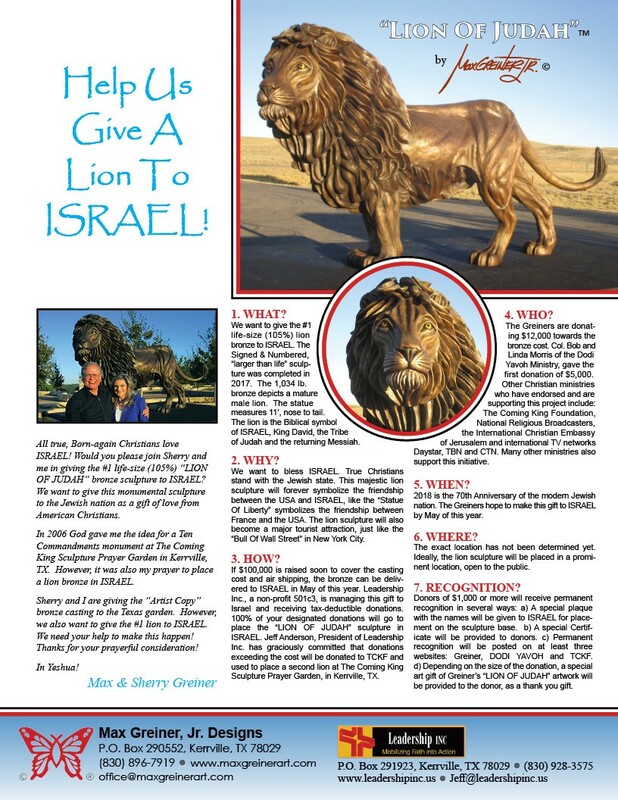 SERV MINISTRIES collaborated with Christian Ministries and Donors to gift Artist Max Greiner’s “Lion of Judah”, monumental bronze sculpture, to the people of Israel in honor of their 70th Anniversary.